NEW YORK, Feb. 6, 2019 /PRNewswire/ -- Moeda, the first cooperative lending platform powered by blockchain technology, today announced the launch of its mobile application, designed to allow impact investors an additional way to invest in and track the progress of their Moeda Seed project investments. The app also allows MDA token holders the ability to track the token price in real time. The launch also includes the Moeda Wallet, which allows MDA token holders to manage different cryptocurrencies inside Moeda ecosystem, including the MDA token, MDAX for game play, MDABRL for investment into projects, and MDALOYAL for airdrop reward or giftcards. As part of the mobile app launch, Moeda is providing two ways for individuals to win free tokens. Moeda will issue MDALOYAL tokens to those who activate their Moeda wallet and will reward users with a 10 percent annual yield on the MDA token they keep inside the Moeda Wallet. Moeda will also offer MDAX game coins to those playing the Moeda Go game. "The launch of our mobile app places the power to make impact investments in the palm of investors' hands," said Moeda CEO Taynaah Reis. "At the touch of a couple of screens, investors can see the progress being made on seed projects, no matter where they are. Investors can also check out new Seed Program investment opportunities as they come online and see for themselves the difference they are making to these women-owned agricultural-based family cooperatives." Moeda's Seed Program facilitatesaccess to financing and offers technical assistance to unbanked and underbanked businesses whose growth supports the United Nations' Sustainable Development Goals. Each project offers impact investors an opportunity to make a difference in businesses underserved by traditional investment platforms. Investments allow for growth that contributes to reducing poverty, inequality and climate threats, while promoting local development, women's empowerment and creating sustainable wealth. The Moeda Seeds App will also be used by entrepreneurs receiving Moeda seed project funding, providing them a way to make end-to-end payments instantly and provide more accessibility via digital tokens, avoiding limits and government fees on all transactions that take place within Moeda's payment ecosystem. The mobile app allows for a transparent record stored on blockchain of financial and other transactions made through the application. As more and more projects are funded, businesses will be able to share knowledge, new impact models and mutual support via project information on the app. 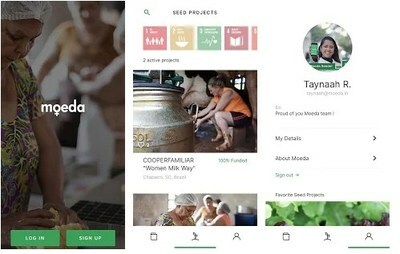 Moeda currently has three seed projects accepting investment - Sustainable Coffee, COOAFES, and COOPEREDE - and investors can fund any of these projects through the mobile app. The app is available for download in the Google Play store. Founded in April 2017 by Taynaah Reis, Brad Chun and Isa Yu, Moeda (moedaseeds.com) is the first cooperative lending platform powered by blockchain technology. Moeda's mission is to promote a fairer and more impactful economy by connecting investors directly to entrepreneurs. Moeda, through its Seed Program, facilitates access to financing and offers technical assistance to unbanked and underbanked businesses whose growth supports the UN Sustainable Development Goals. Each seed project offers investors an opportunity to make an impact in areas underserved by traditional investment platforms. Investments in businesses in the Seed Program allow for growth that contributes to reducing poverty, inequality and climate threats while promoting local development, women's empowerment and creating sustainable wealth.